On the 12th July 2014 I went to London Film and Comic Con LFCC for the first time. It was insane, chaotic, incredible and amazing all at the same time. The reason why I wanted to go there was because I'd never been and also Jenna Coleman was going from Doctor Who she plays Clara Oswald. As part of my 21st birthday gift I was allowed to book tickets to her talk and a photoshoot ticket. So I could have a photo taken with her to keep, I managed to get tickets I couldn't quite believe it until the tickets came in the post. I went there with two of my best friends from College. It was a long journey to London but so worth it. I ended up in the queue for a stupid amount of time I think it was 2 hours or 2 hours and a half that was just to even get in the building. Let alone trying to get to the talk or waiting in line at the photoshoot for Jenna. When I finally got into the building it was just rammed there were people everywhere. You couldn't move breath think, you couldn't really do anything. 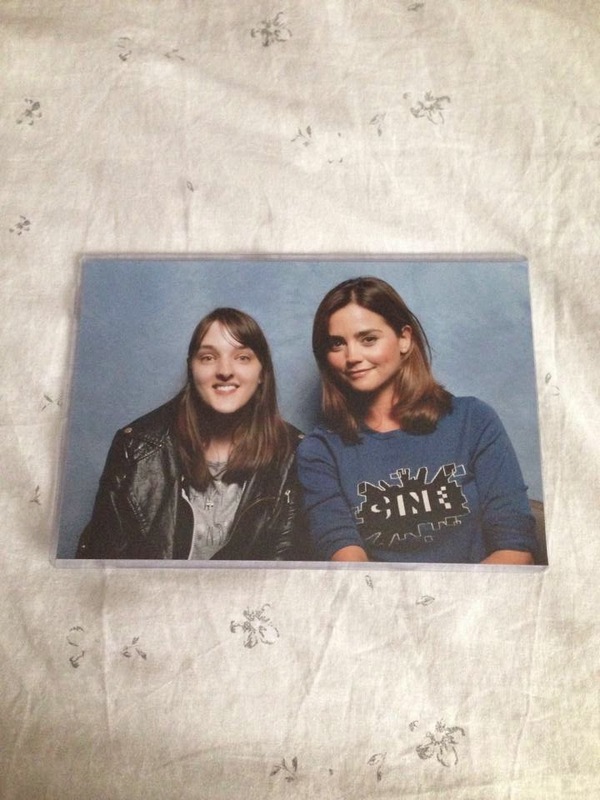 After I tried to get used to the situation I was in I found out from my ticket that I had to attend the Jenna Coleman talk soon otherwise I would miss it. I found out that I was in the wrong building for the talk that I wanted. So one of my best friends said he would take me to the other building to the talk. When I got there it had already started and Steven Moffat was there too which was cool. The part of the talk that I saw was great I loved it, I just couldn't quite believe that I was in the same room as Jenna Coleman. After the talk had ended I met my friend again and as the photoshoot wasn't for a few hours yet. I took the chance to have a walk round Earls Court where London Film and Comic Con was, to see what was around and what the stalls were selling. There was just everything anything you could think of to do what whichever fandom you wanted they probably had it. I saw a few Twilight Saga merchandise products and jewellery items I also saw merchandise of The Fault In Our Stars but didn't purchase any of it. I saw lots of Doctor Who merchandise and The Vampire Diaries merchandise but again I didn't pick anything up. The only item I did purchase was the Hermione's Time Turner necklace from Harry Potter. Which I love, I love Hermione so much and the sand actually moves, it was only five pounds. I went over to another stall and they were selling the exact necklace for 10 pounds so it just goes to show make sure you look around to see if you can get the exact item you want for a cheaper price. Now onto the photoshoot I had a certain three digit number on my ticket that I had to show so I could get in the right queue. It didn't take long for the queue to get moving and while I was waiting with my friend. Some security guards came through with Jenna and I was so shocked that she walked past me, she was next to me, I couldn't believe it. My friend turned round to me and said I thought she had blonde hair, I said no she has brown and that it was Jenna that just walked past us. If any of you reading this love Jenna and Doctor Who as much as I do you will understand the fan-girling when one of your favourite actors/actresses walks by you. I was so nervous my legs were shaking so bad they felt like jelly. When it was nearly my turn to go into the studio I gave my friend my bag and then I went in. 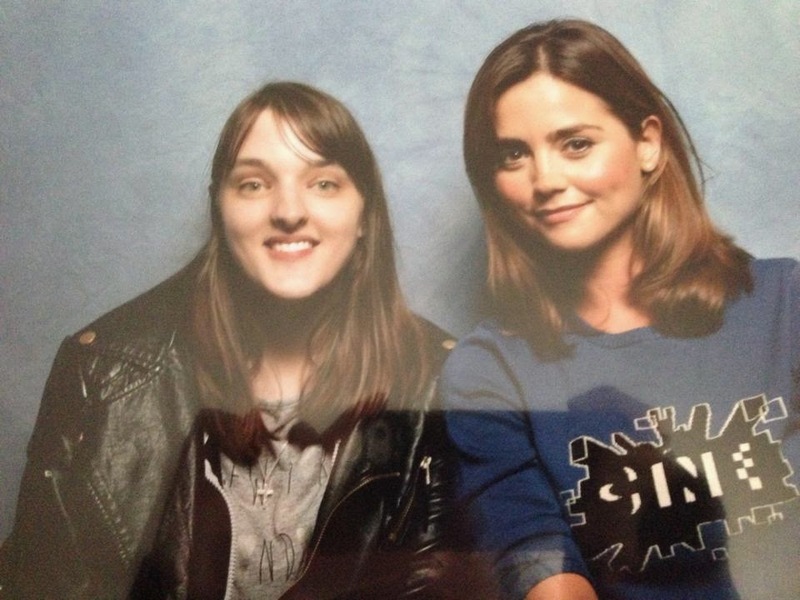 I was in the small queue for about five minutes and then before I knew it was standing near Jenna waiting for her. She was sitting down and then I was called up next it lasted seconds but they were seconds of perfection. I sat down on the chair next to her she said hello and asked me how I was I was so nervous I think all I said was hello back. Then I looked at the camera and smiled after the photo was taken I got up and said thank you to Jenna. I went to collect my photo that prints out straight away. I prayed that I looked alright and that I hadn't got my eyes closed in the photo. After I got my photo which looked great I came out and met with my friend I was still shaking and in shock. I then went to get a cover for the photo so it wouldn't get damaged or anything on the long train journey. After all that people were leaving and everyone was tired so I left to go back home. Overall I would highly recommend going to London Film and Comic Con even if you don't want to meet any celebrities. However if you do you can also get an autograph if you want too. I loved it and would happily go again Jenna looked amazing as always and I later found out that she was feeling ill that day this makes me love her even more she is so dedicated to her fans. She greeted us, did the talks and took photos and signed photos whilst feeling ill. She is just amazing I would also love to go to the American Comic Con one day. For more information please check out my YouTube video where I go into more detail about this experience. Did you go to London Film and Comic Con this year? Have you met Jenna Coleman or any other Doctor Who actress/actor there? What merchandise did you buy?